A newly discovered asteroid named 2016 DV1 is expected to make a very close flyby of Earth on March 3, 2016. 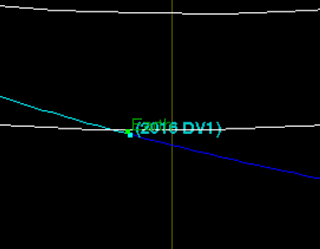 2016 DV1 is an Apollo class asteroid discovered on February 28, 2016. Its estimated size is between 28 and 62 meters (92 to 203 feet), which is about twice the size of Chelyabinsk asteroid. 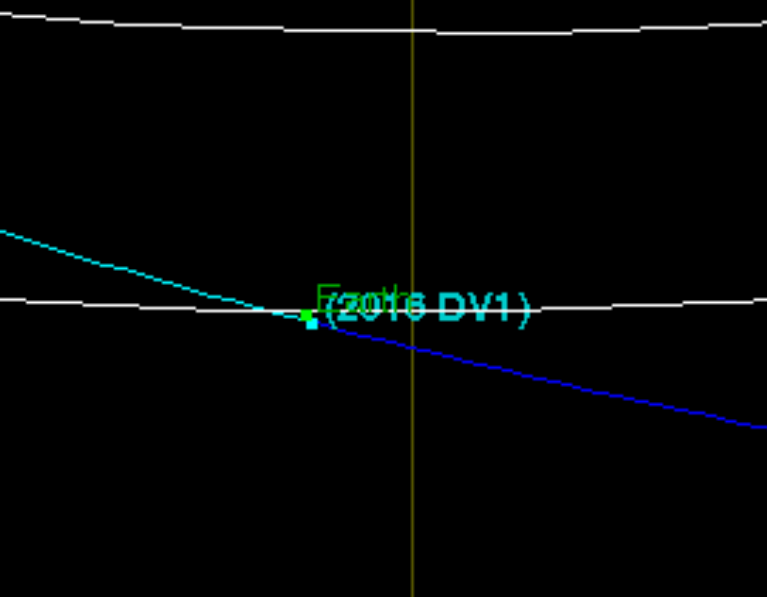 2016 DV1 is traveling at a relative velocity of 18.08 km/s and at the moment of closest approach – 05:17 UTC on March 3 – it is expected to fly by us at about 1 LD (lunar distance). That's about 384 400 km (238 900 miles) above Earth's surface. 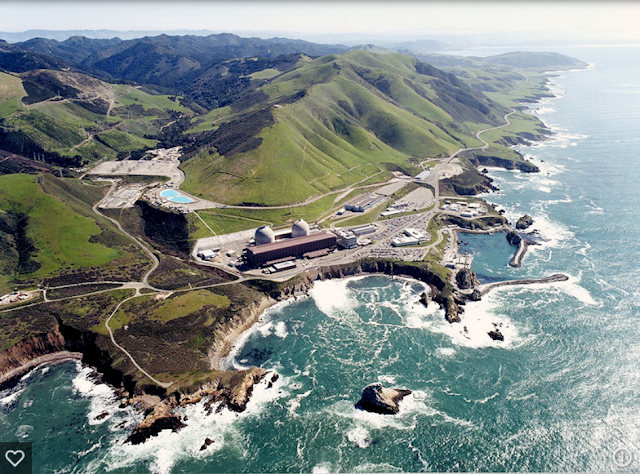 Diablo Canyon Nuclear Plant. What if this asteroid hit in the ocean anywhere nearby? Look at that wave amplification bay and center pivot rock? Do you think they figured out why the bay is scooped out as it is? Because that center rock amplifies the waves as they recombine on the backside. Duh! Your calculator is off because it doesn't account for friction losses when the asteroid hits the atmosphere. What did you say your degree was? Also, if the asteroid hits water vs land it would have a different effectime and magnitude. It's simple. Its a broad range considering the assumptions that have to be made. Density has to be assumed, diameter is sometimes a pretty broad guess. So the frictional losses are pretty minor in relation to the other uncertainties. 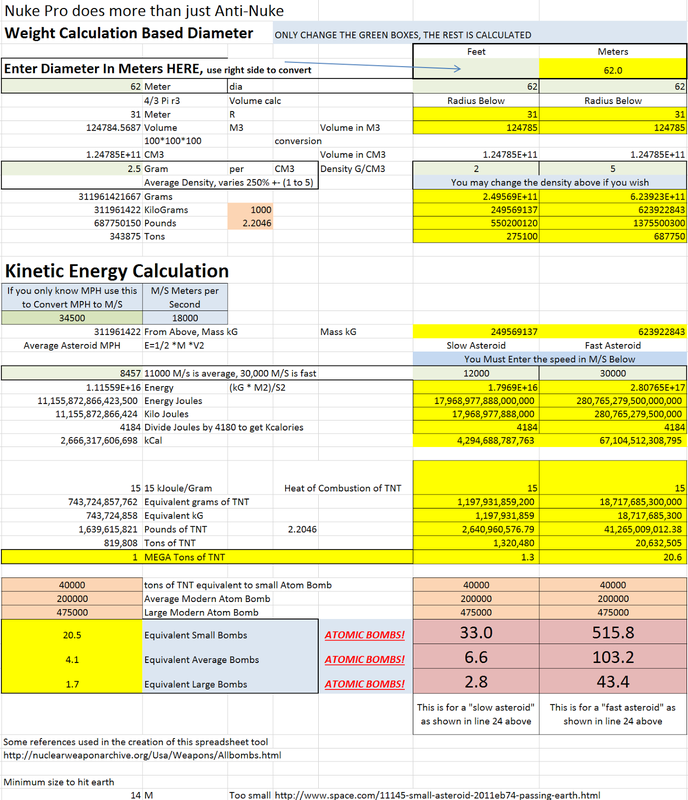 Much of the friction will result in heating of the 'roid anyway, so that energy is "conserved". You would also have to consider angle of incidence and that would be a crap shoot. See once again, you over-complicate where there is no benefit, kind of like your method of boiling water. Then compare the crater size from the asteroid to the same size for a comparable h bomb. Much more accurate. Do the job. But do it accurately. Accuracy matters when you are,seeking validation. They don't have the data that you suggest, its just an OK site, and no free Asteroid Calculator download, so that is weak. 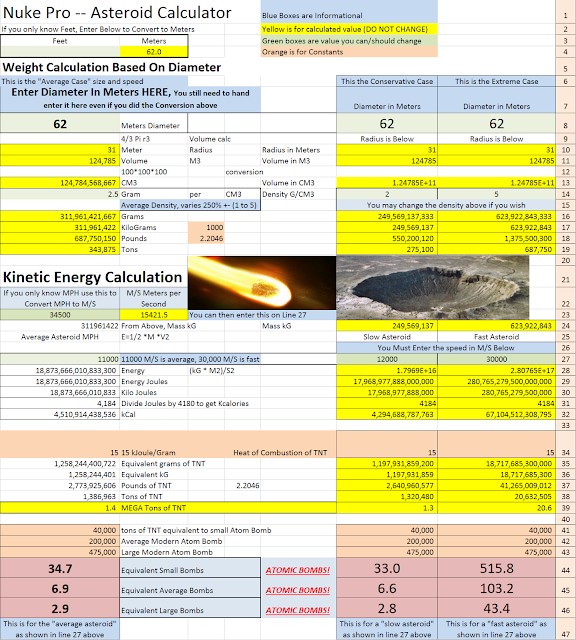 All you need is that site and a similar one that provides crater characteristics for weapons effects (I have a cool circularcslide rule from Glasstone's book)and find those parameters e.g. 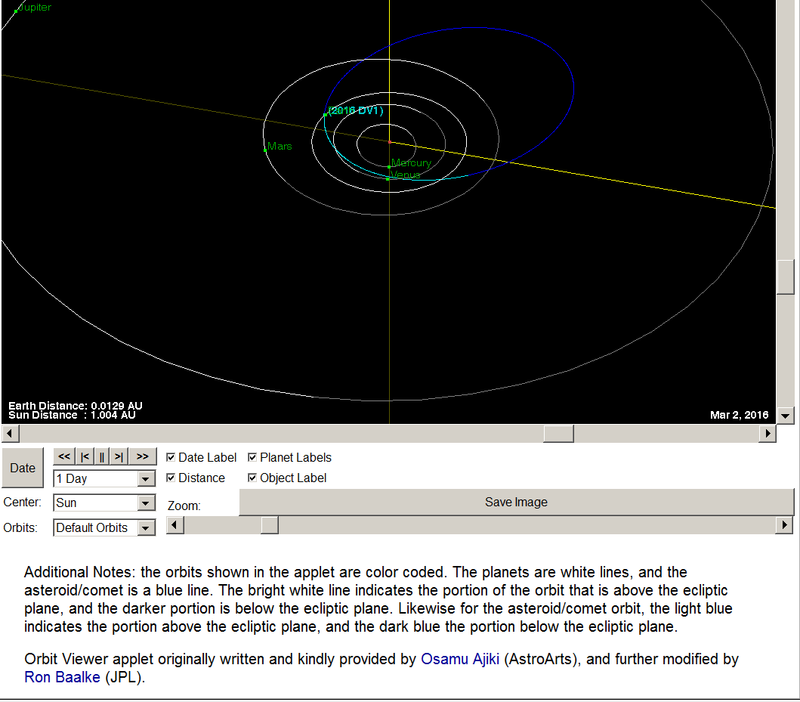 yield, asteroid size,that result in the same general effects. You can then plot them against each other. I bet it's close to a linear regression.